What’s the opposite of sticker shock? It’s hard to believe these speakers are this inexpensive. Some speakers are criticized for their overt personality, for exaggerated (or undernourished) tonal characteristics that can misrepresent the music. 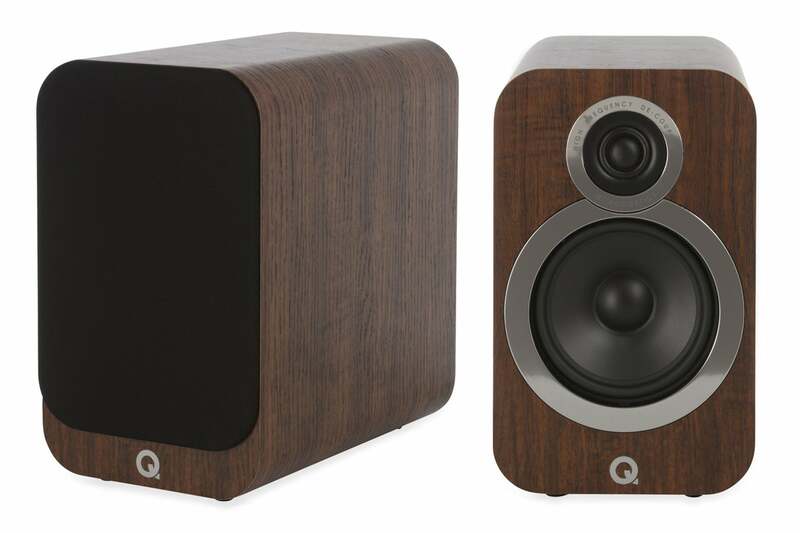 But it’s hard to imagine anyone taking Q Acoustics to task for what they’ve wrought with the personable 3020i bookshelf speakers. These speakers' special distinction is a focus on soundstage optimization and unwavering clarity that serves almost every musical master exceedingly well, from classical to folk, rock to hip hop to jazz. These speakers will send you running for your favorite recordings, so you can hear what nuances will be revealed. They imbue studio performances with such presence, depth, and bounce as to create a sort of sonic hologram that pinpoints musicians’ spatial placement in the mix, not just in the horizontal plane but also forward and aft, high and low. And it all comes from an attractive package that positively oozes quality at an almost unbelievably low price: Just $299. For the pair. The 12-year-old Q Acoustics design team is largely comprised of alumni from a host of august home audio brands, including KEF, Meridian, Mission, and Tannoy. The company’s pinch-me pricing is achieved by manufacturing its speakers in China and selling them direct, at QAcoustics.com and via online storefronts at Amazon, Jet, Reverb, eBay, and Walmart. The 3020i is the second up model in a full range of 3000i-series speakers. You can mix and match them for multiple rooms and multi-channel home theater installations. 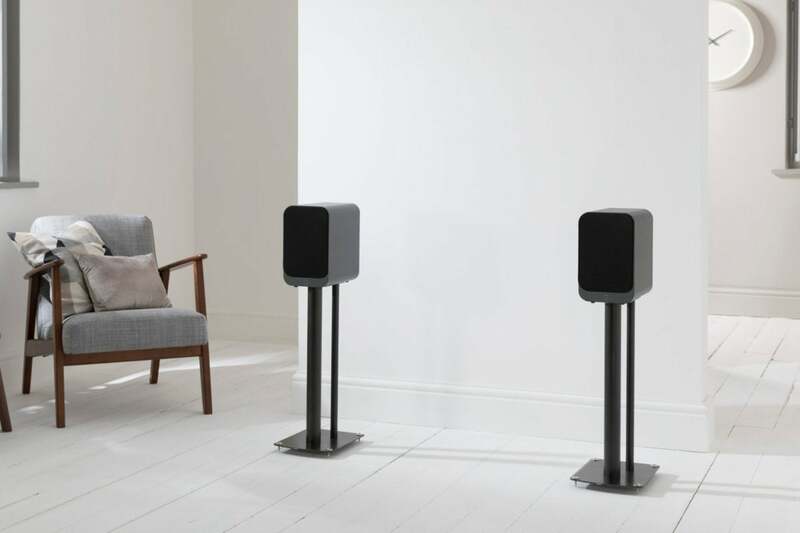 The 3020i are in the middle of a range of speakers consisting of the smaller 3010i speakers at one end and the 3050i floor-standers at the other. 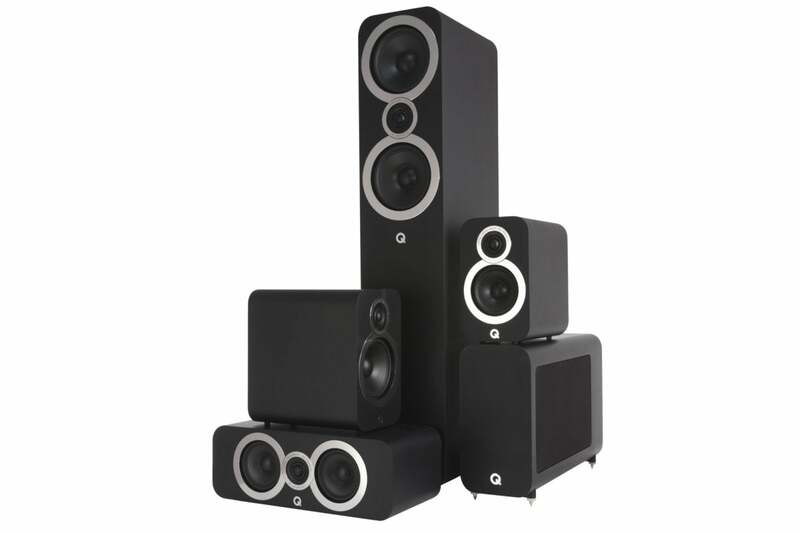 If you’re looking to build out a 5.1-channel system for your home theater, Q Acoustics also offers the 3060S subwoofer and the 3090Ci center channel. 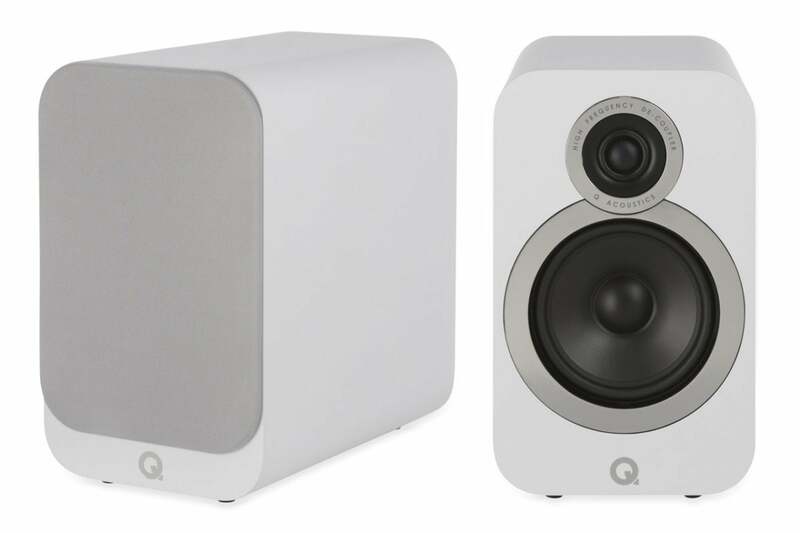 On their own, however, a pair of Q-Acoustics 3020i’s fabulous for both music and TV/film presentations, especially in a small to mid-sized room. Honestly, these two-way, rear-ported speakers could easily pass for floor-standers. On the cinematic front, they swept me away with precisely calibrated dialog, dynamic in-motion sound effects, and robust scoring. My test equipment included a Sonos Connect:Amp and a Oppo BDP-103 Universal Blu-ray CD//SACD/DVD-A steaming video player player. With 55 watts per channel, the Sonos falls smack dab in the middle of the recommended power range (25 to 75 watts) for the moderately sensitive (88dB) 3020is. Sufficient to crank the speakers to a Spinal Tap-ish “eleven” with most content in my family room, though really sounding at their best at the middle of the amp’s range. Yes, these are bookshelf speakers, but they beg for placement on stands so you can set them a little further from the wall behind them. These ears also obsessed over made-abroad musical content, from Sting’s arresting Live in Berlin, videoed in concert with the Royal Philharmonic Concert Orchestra on Deutsche Grammophone/UMG Blu-ray disc, to the newly unearthed (by Columbia Legacy) 1960 Euro concert sessions of Miles Davis and John Coltrane (The Final Tour – The Bootleg Series Volume 6). Yes, the quintet romps through the likes of “Bye Bye Blackbird,” “On Green Dolphin Street,” and “All Blues” in pristine monaural. And everything is firmly phantom-centered on the Q Acoustics; yet, there’s a sense of staggered depth and room ambience in the playback that sounds 3D-ish! I also streamed the new self-titled set by Cuban mambo jazz band Orquesta Akokan (on the Daptone label.) The 3020i charmingly celebrate both the quaint, brassy sound of the ensemble, and the fabled, resonant qualities of the wood-paneled Areito studios at EGREM, the state-owned music complex in Havana where Buena Vista Social Club also recorded. Our test speakers also showed their mettle with the just-out ECM classical oddball Tangere performed by Alexei Lubimov. Covering works by the lesser known C.P.E. Bach, the Russian keyboardist is playing the now obscure tangent piano, a hybrid invention of the 1700s that is evocative at turns of harpsichord, clavichord, and hammer dulcimer. With the 3020i put to the task, that eccentric, quirky nature is apparent and intriguing. You’ll never confuse the sonic portrayal as just another small piano. While deeper than the average bookshelf speaker, the recessed, banana plug-friendly binding posts on the 3020i reduce the space needed behind the cabinets. To coax tight and accurate sound out of small boxes with extended bass response, Q Acoustics’ engineers built the 3020i with a 25-percent larger cabinet than was deployed in the earlier 3020 (without the “i”). The cabinets grew in depth especially—to 10.9 inches—so they’re nearly as deep as they are high (11.1 inches), a fortuitous formula for boosting dynamics. While no wider (6.7 inches) than average bookshelf speakers, you might find these too deep for shelf placement, even with their deeply recessed binding posts. If you do intend to place them on a bookshelf against a wall, you’ll likely want to insert the included foam bungs into their rear reflex ports, to subdue exaggerated bass. A better placement would be on stands, a few feet away from the wall, preferably at ear level (when seated, that is). Clean, curved-corner unibody construction (there are no visible seams or indents) and robust internal stiffening are key to the 3020i’s sonic refinement. These design elements aim to eliminate unwanted vibration and coloration and fine-tune signal delivery. Q Acoustics applies its trademarked “P2P” (point-to-point) bracing technology here to tighten up areas of the MDF-constructed box that suffer the most strain, such as the corners and the front baffle that supports the tweeter and low-frequency/mid-range driver. Have it your way: magnetically-attached cloth covers lend a discrete look to the Q-Acoustics 3020i, while taking the covers off provides a flashier tech fashion statement and airier sound. 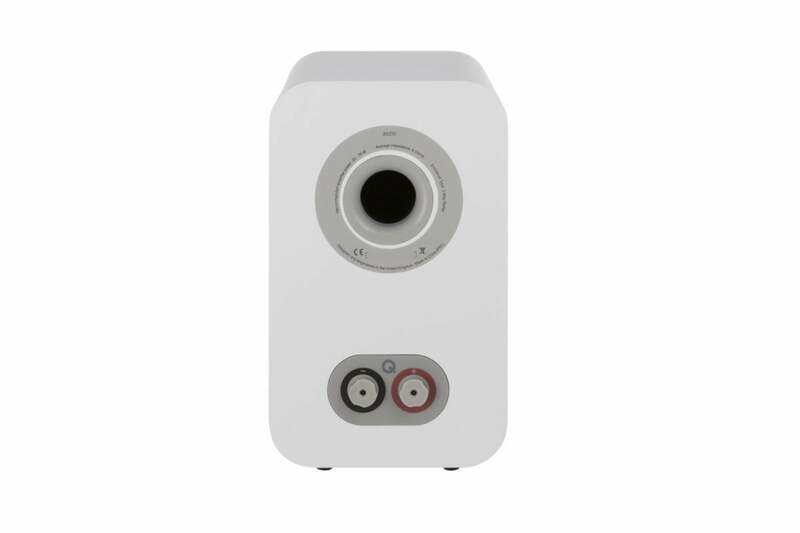 Q Acoustics is equally proud of its proprietary, coloration-free drivers, of course, which collectively achieve a frequency response of 64Hz to 30kHz (+3 dB, -6dB.) The 5-inch low/midrange units utilize an extra sturdy Aramid fiber material for the cone, coated with an acoustically neutral material (mostly to prevent damage in humid climates). The cone is surrounded with low-lag rubber for accurate movement. The 0.9 inch soft dome tweeter is polyester microfiber with a polypropylene surround that decouples it from the baffle. I prefer the look of these speakers (available in vinyl-laminated Graphite Grey, English Walnut, Carbon Black, or Arctic White finishes) with their magnetized black cloth grills in place. With grills off, your eyes are drawn to the semi-shiny bling of metal trim rings surrounding the woofers and tweeters, a look that shouts “boom box” to me. But I found it essential to take the grills off for my listening tests. It was the only way realize the full holographic effects these magic makers can create, and to eliminate any trace amounts of signal blunting and distortion. This was particularly noticeable while listening to Sting and the symphony vamp like mad on “Every Little Thing She Does Is Magic.” The issue here is that the artist introduces a bit of intentional microphone distortion to thicken his vocals. That extra grit is bearable with the grills off, but it sounds more like nasty sputtering with them on. I also found the need to futz with the Sonos amp’s EQ controls with the grills on, making adjustments when revisiting familiar album pleasures such as bassist Rob Wasserman’s sonically immaculate Duets, with collaborators like Aaron Neville, Rickie Lee Jones, and Jennifer Warnes (also available in Wasserman’s Trilogy collection); the newly remixed (by Bob Clearmountain) 50th anniversary edition of Music from Big Pink (The Band); and when jumping into Stevie Wonder’s masterwork Songs in the Key of Life in 24 bit/96KHz fashion on Pure Audio Blu-ray. It was a totally different story with the grills off. I could then leave all settings flat and just flip on the Sonos amp’s “Loudness” setting to let the 3020i frolic: bold, free, and happy. Me, too. Editors' note: This story was updated shortly after publication to correct the reference to the Ultra HD Blu-ray player that was used during the evaluation. Royal sound on a commoner’s budget: That’s the goal achieved with the Q Acoustics’ 3020i bookshelf speakers.